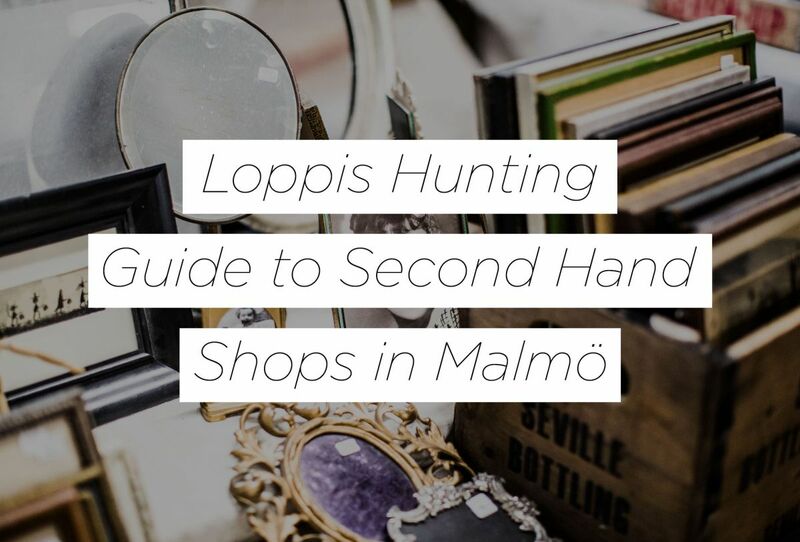 Loppis hunting is a serious Swedish pastime and a great way to pick up some bargains. Literally translated as “flea”, loppis stores are the equivalent of second hand and charity shops. You never quite know what you’ll find! Personally I (a huge eBay fiend before moving to Sweden) think visiting loppis shops are more fun than a good eBay session as there’s a real sense of joy when you find a bargain with no chance for you to lose it to someone else bidding higher! I’m going to break this list up to my favourite Loppis shops (physical stores) and my picks for Malmö’s best loppis marknads (the original form of loppis). So while you’re on the hunt for bargains, perusing the shelves for Scandinavian design gems, you can rest assured you won’t be paying top dollar for them. It’s worth noting that while some loppis stores sell clothes, second hand clothes stores also exist as a separate entity. My preference is home design but I’ll naturally mention what each of these places sells, etcetera. Now, to the guide! A firm favourite of mine as it’s as centrally located in Malmö as you can get and its turnover of items is regular. LL functions as a store that represents individual sellers. The shelves are all numbered and function as separate shops within the shop. You’ll see a lot of variety here with items priced at the mini store owner’s prerogative – if they don’t know what an item is worth then sometimes you can get a real bargain! If you’re like me and enjoy the thrill of the hunt then LL is a great stalwart. Their more expensive items are in glass cabinets and they have a specific section behind the kassa for nice shoes and occasionally the old musical instrument. If you like art they have a section at the back for pictures and it’s a great place to pick up kids clothes, crockery, toys etc. The staff are very friendly and there’s even a section at the front with gratis kaffe and occasionally some biscuits too! Not so much a flea market as an “ant” market, ahem! (Myrorna translates as The Ants, so if you’re searching for it on Google that’s what it sometimes comes up as, don’t worry you aren’t going mad!). The name might imply small but this particular branch of Myrorna has a huge section of everything – glassware, clothes, electronics, toys, big furniture, books, the lot basically. Another one of my favourites as they regularly cycle through their stock and there’s always a good variety. The book section here is huge and they have a great section in English with 3 for 2 offers on paperbacks. Myrorna are generally aware of the quality they’re selling so don’t expect to find ridiculous bargains (unless something slips through the net), but they often have deals on named items like plates etc. This one is big and central, it feels like a proper department store and is always well stocked throughout the year. Emmaus is very popular so you’ll always see people around on the the hunt for a good bargain. Half of the floor space is clothes with good selections for women, men and children (shoes included) and there’s a large changing room area. The rest of the store is homeware, lights and books and the selections change regularly with some real treats popping up every now and then. Some of the furniture they get are originals and the prices are fair for what they are. If the one on Ystadvägen is the big version with lots on offer then this one is smaller, more bespoke and a little bit more expensive than its siblings. It’s super convenient as it’s in the mall but compared to the ones in central Malmö it’s a bit off the beaten track. It certainly feels like they’ve selected all of the nicer things from their collective stock and placed them all here! This is another BIG store with lots of big furniture, clothes, toys, books and DVDs. It’s a bit harder to get to on public transport but worth the effort if you’re looking for furniture. Situated immediately behind Willys and around the corner from Värnhem, Trollets is a bit of a hidden gem. Well worth a visit if you’re in the market for big, old furniture and taxidermy. Their shelves are bursting with items so you’ll definitely get the thrill of the hunt. Many items are unpriced and you have to speak to a member of staff for a price. A little smaller and more central than its siblings, this one is like a happy medium between the other two. A fair selection on home goods, crockery, toys, clothes and books. I’ve found some real bargains in here but the selection is a bit more limited. Well worth the visit if you’re in the Triangeln area. Another one in the Värnhem area, (there is another article on BIM about one of the Stadsmissions), this one is fairly big and centrally located. It has a modest selection of everything and is worth a look if you’re in the area. This one is a real hunter’s paradise as the shelves are bursting and the owners are always combing through the items. We regularly pop in and the stock rotates a fair amount. The owner is friendly and is prepared to haggle a little bit. Expect to pay with cash or Swish. This one is another little gem, a modest selection of everything and a nice little coffee stop to boot. They regularly have sales of up to 50% off and we have picked up some mega bargains here. They have a decent English book section and a good range of homeware and crockery. LMs are a big different to shops in that they are buildings/areas where a group have got together to sell their wares next door to each other. Perfect for bargain hunting! One such place is Sallerups lopp & prylmarknad. This one is on the way to Bulltofta and it’s a “blink and you’ll miss it” opportunity. It’s an indoor market with lots of stalls and a huge amount of items. They have some niche selections of collectors items and an abundant selection of everything else. Mineral and Jord occasionally have a loppis. In Folkets Park they regularly run outdoor loppis markets throughout the summer including some craft, hipster and the super popular Barn Loppis (a perfect place to go to look for bargains on kids clothes). The best advice here is to keep an eye on Facebook and be active on the Groups, that will keep you abreast of dates and times for the pop ups! Best In Sweden is your news, entertainment, music fashion website. We provide you with the latest things straight from Sweden.